What's this fuzz all about? "Because there is a law such as gravity, the universe can and will create itself from nothing. Spontaneous creation is the reason there is something rather than nothing, why the universe exists, why we exist [..] It is not necessary to invoke God to light the blue touch paper and set the universe going." But again: why this hype? We know already for ages that the formation of our universe out of nothing is a perfectly viable and consistent hypothesis. In fact, given the constraints of the various cosmological observations, I know of no other workable alternative hypothesis. So nothing new. Yet, the current media hype surrounding Hawking's statement indicates that many people continue wondering how our world could emerge out of nothing. "Look at us, look at the earth, look at the sun, all the stars and galaxies. How could all this magnificence emerge from nothingness?" If this question is also on your mind, let me introduce you to a little secret. Although some more recent auxiliary insights come in handy, the core of the argument why 'everything' can emerge from 'nothing' is more than a century old. Yes, you read that well. More than a century. Einstein's theory of gravity is the key towards understanding the creation of the universe. Even better: for a qualitative understanding of the 'All from Zilch' paradigm you don't really need Einstein's theory of gravitation. Good-old (more than three centuries old) Newton's theory of gravitation suffices. 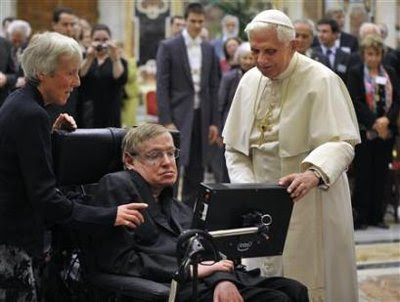 The Pope inquiring about the place of God in Hawking's latest theories. Stephen doesn't look all too happy. So where does all the mass in the universe come from? Since Einstein we know that this is not the right question to ask. Mass is not a conserved quantity. Mass is a form of energy (rest energy) that can be created from other forms of energy. Total energy (rest energy plus all other forms of energy), however, is conserved. So the right question is: where does all the energy come from? The surprising answer is: the aggregate of available cosmological measurements indicates there is no such thing as 'all the energy'. Within current measurement accuracy, the total energy of the universe adds up to zero. Zilch. Nada. As suggested by Hawking's remark, it is gravity that acts as bookkeeper of nature's energy balance sheet. While the individual energies of all the objects in the universe add up to a more than significant amount, when the gravitational energy associated with the coupling between pairs of objects is included, the grand total energy adds up yo zero. So this simple model describes two objects starting at vanishing separation with vanishing energy. These objects gather energy (move apart with ever-increasing speed) such that the sum of the individual energies grows proportional to the separation. This outcome can be thought of as a rough description of the expanding universe. Interpreting E as the sum of the individual energies of all the objects in the observable universe, and D as the diameter of the observable universe, it follows that in natural units in which the speed of light c and the gravitational constant G both have numerical value equal to unity, the total mass/energy content of the observable universe should be roughly equal to its diameter. Observation tell us this indeed to be the case. The diameter of the universe is 93 billion light years or 1061.7 clicks in natural units. The total mass/energy (including dark matter and dark energy) is 6.5 1053 kg or in natural units 1061.5 Plancks. So, the fact that the diameter of 'All that is' (the observable universe) is roughly equal to its mass, should not surprise you. It has to be so for 'All' to have emerged from 'Zilch'. That is one coincidence less. I am. You are. We are. But in gravitational relationship to the rest of the universe, we are nothing. A nothing that is. How very Zen. Oh, and by the way: 'The Grand Design' is for sale in the US starting today. Following the media hype it should not surprise you the book is already topping Amazon's sales list in science. * The book is co-authored by Stephen Hawking and Leonard Mlodinow.